After a couple of hours I decide to take an alternate route home that will pass along another possible locality for the limestone salamander. 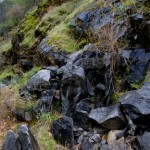 It takes me a while to scout the area and determine the best places to look. 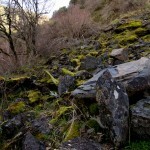 I can immediately tell that I’m not alone in my thinking: the boulders at this site had recently been turned. 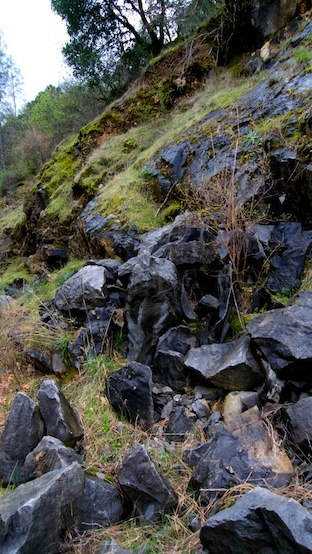 They are not wantonly flipped, ruining the habitat…but I can tell that they are just slightly askew, carefully put back in place but revealing past activity. I can only hope that the previous visitor(s) were enthusiasts and photographers and not animal collectors. After a couple more tiring hours of scrambling around talus slopes and flipping heavy rocks, I’m ready to call it quits and make the long drive home. I carefully flip cover on the way back to my car and turn up two juvenile H. brunus within 5 minutes of each other. Once again I feel the rush of succeeding and seeing a new species, especially one as rare as this. I quickly photograph the animals in the fading afternoon light, return them to their rocks, and drive back home through the stunning rolling oak and chaparral foothills, across the Central Valley, and back into the Bay Area. This had been my longest single-purpose day trip for a salamander and I, despite my exhaustion, am thrilled. Now, don’t think that searching for salamanders needs to be a marathon driving session, at least if you live in the Pacific coastal states. 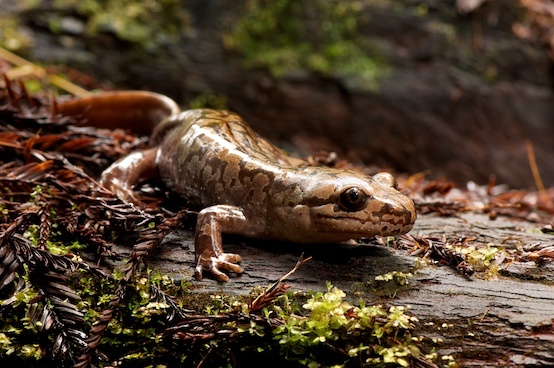 While they become scarce to non-existent throughout much of the interior western states, there are nearly 50 species of salamanders in California and the Pacific Northwest. 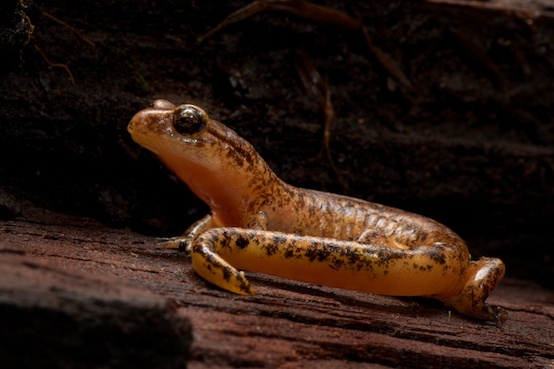 With a little planning one can enjoy a long weekend outdoors and spend time searching for these near-forgotten amphibians. 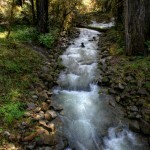 Last year I took my family to northern California for a long weekend of relaxing activities. To balance comfort with excitement we spent a couple of nights in a hotel and a couple nights camping in the chill February forests. By day we would hike various trails while I looked under every suitable log, under the bark of fallen trees, and in leaf litter searching for winter amphibians. In a vernal pool I found the egg masses of the northwestern salamander, Ambystoma gracile. 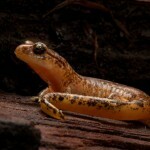 Under logs and rocks I found numerous Plethodon elongatus and painted ensatinas, Ensatina escholtzii picta. Near flowing streams I found the huge Pacific giant salamander, Dicamptodon tenebrosus, and rough-skin newts, Taricha granulosa. I also found my first wandering salamander Aneides vagrans under the bark of a fallen fir tree; all this while walking around the old growth forests of Redwood National Park. Despite this success there were still several species of salamanders that I did not locate. 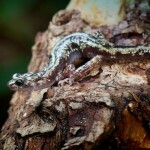 Even if driving and camping is not your desire it is frequently easy to find salamanders around home. 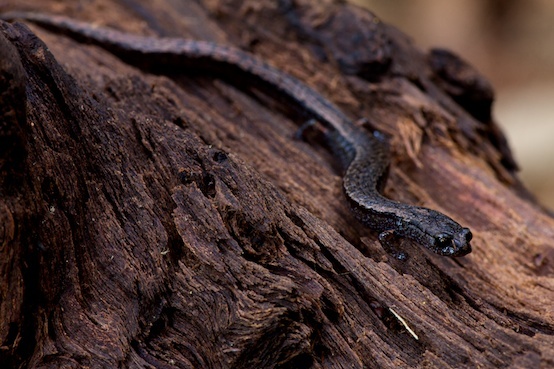 The California slender salamander, Batrachoseps attenuatus, and its close relatives are extremely common in many areas and can even be found in backyards of heavy urban areas such as San Francisco. 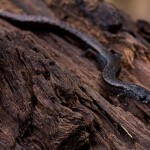 Also commonly found in oak woodlands around the San Francisco Bay Area are arboreal salamanders, Aneides lugubris. 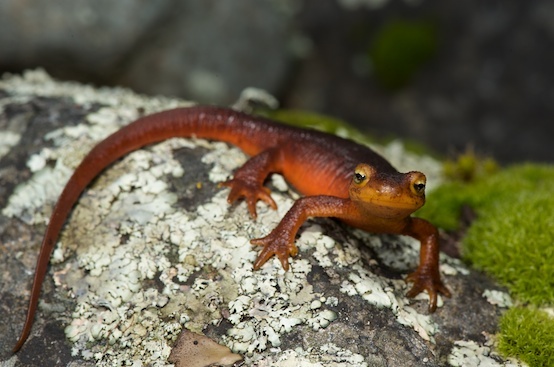 In woodlands, open areas near streams or ponds, or forested areas one can find California newts, Taricha torosa, sometimes even wandering during daylight hours as they prepare for their winter breeding aggregations. 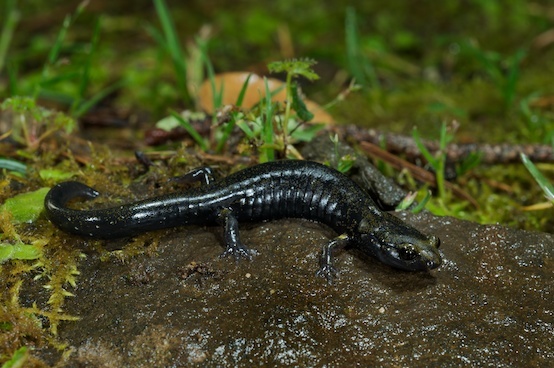 South of the San Francisco area the cool, moist Santa Cruz mountains are ideal habitat for these and other species including the California giant salamander, Dicamptodon ensatus, and the highly threatened Santa Cruz long-toed salamander, Ambystoma macrodactylum. 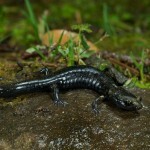 In this region you might even find the isolated population of black salamanders, Aneides flavipunctatus, which chiefly reside in the counties of northern California. But all is not rosy with this picture. 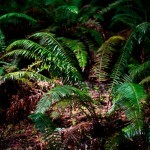 Many of these animals require pristine habitat such as old growth forests to survive. 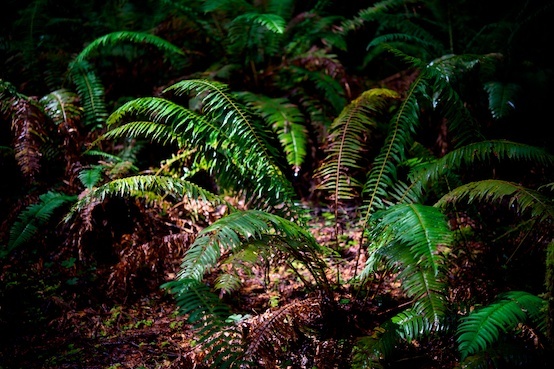 Mature forests have deep layers of leaf litter that offer moist protective cover for sensitive amphibians. 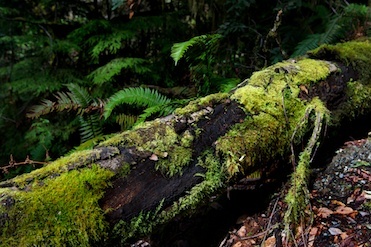 Tree fall stumps provide cracks and crevices for leaf litter and animals away from the ground. Large downed trees provide lots of habitat under them as well as within the separating bark from the tree wood. 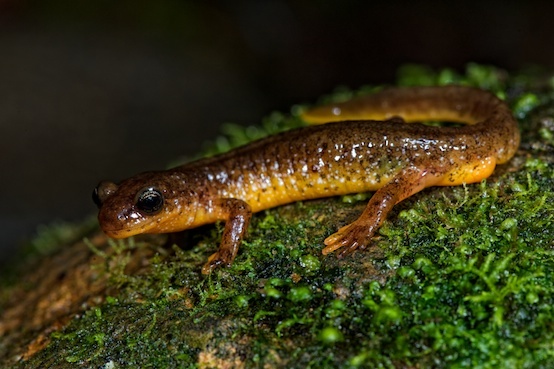 Many salamanders require streams which need to be unpolluted, free-flowing, and containing pools of varying depth and size to partition out species niches as well as larval stages within a species. 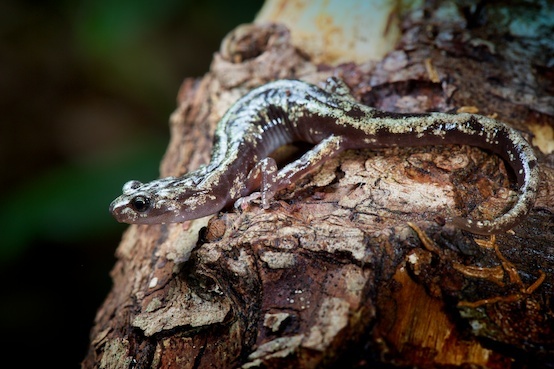 In some regions salamanders may make up the dominant biomass of vertebrate fauna and play important roles as predator and prey within intact ecosystems. Much of this habitat and ecological interplay is missing from logged forests or the narrow diversity offered by farmed and replanted forest. 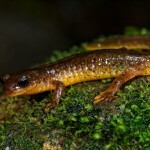 However, the biggest threat to salamanders is their ever decreasing habitat. California’s population is fast approaching 40 million people and we are expanding into more remote areas of the state. 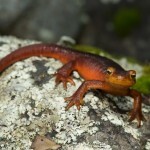 Hopefully, with some awareness and education, we can convince people to protect more wild space and maybe even create suitable salamander habitat around urban areas and backyards. A log pile and small pool may not look as glamorous as a koi-fish pond, but it is far more important for species protection and can be much more rewarding and educational for young people. So how do you go looking for salamanders? First, you need a good field guide (the Peterson series is an excellent choice). These guides are broken up into two regions, the guide to Western Reptiles and Amphibians, authored and illustrated by Robert Stebbins, and the Eastern Reptiles and Amphibians by Roger Conant. These should be in every naturalist’s library. For salamanders James Petranka’s Salamanders of the United States and Canada provides most of the known natural history information and distribution of these fascinating creatures. 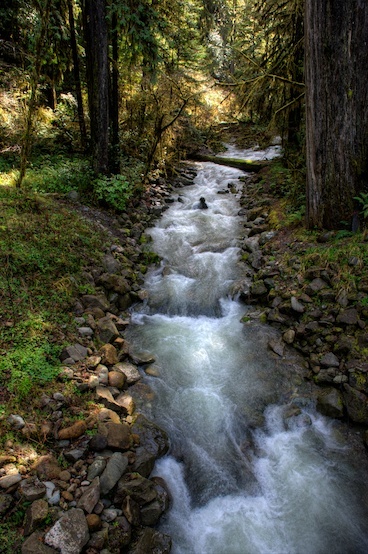 After you acquire a good field guide, head to your favorite outdoor locations and carefully look under rocks and logs, in stream beds, under bark or other cool moist cover and prepare to be surprised. Be careful though, one should never move cover so that it can’t be replaced intact. Also, care must be taken so as not to harm any animal that might be resting under objects. 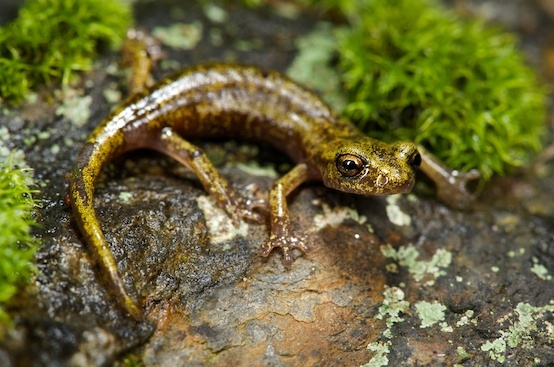 These activities can be especially rewarding if shared with children and the time outdoors can be a great educational tool and immeasurably important in leaving a future generation with greater awareness and a hope for protecting these little known amphibians. Oh, and that third species of Hydromantes? 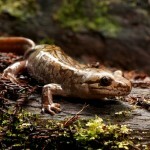 That would be Hydromantes platycephalus, the Mount Lyell salamander. 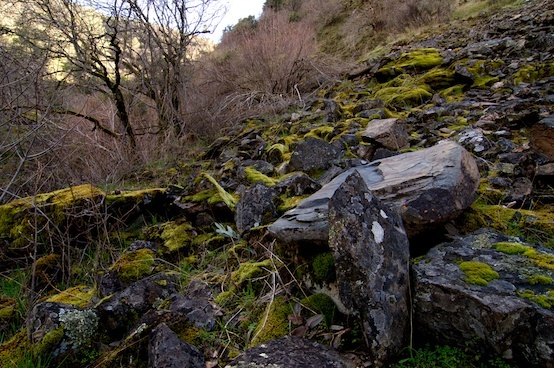 This elusive animal lives in the stony crevices high in the Sierra Nevada mountain range. I hope to complete my web-toed trifecta later this summer…once the 12 feet of snow cover melts.